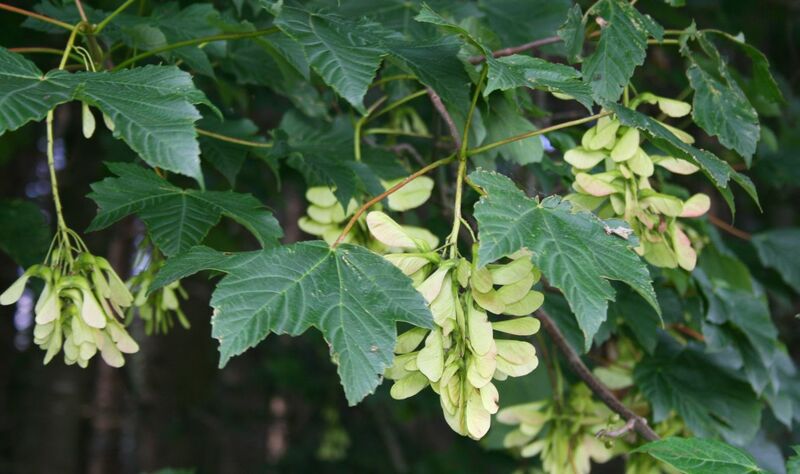 Photo: Acer pseudoplatanus.commons.wikimedia.org. (Accessed 8/2014). Acer pseudoplatanus is a canopy tree to 25 m tall. Bark pale gray to yellow-gray, smooth, sometimes becoming flaky in older trees; terminal winter buds to 0.8 cm wide, greenish, scarcely pointed, wider than end of twig. 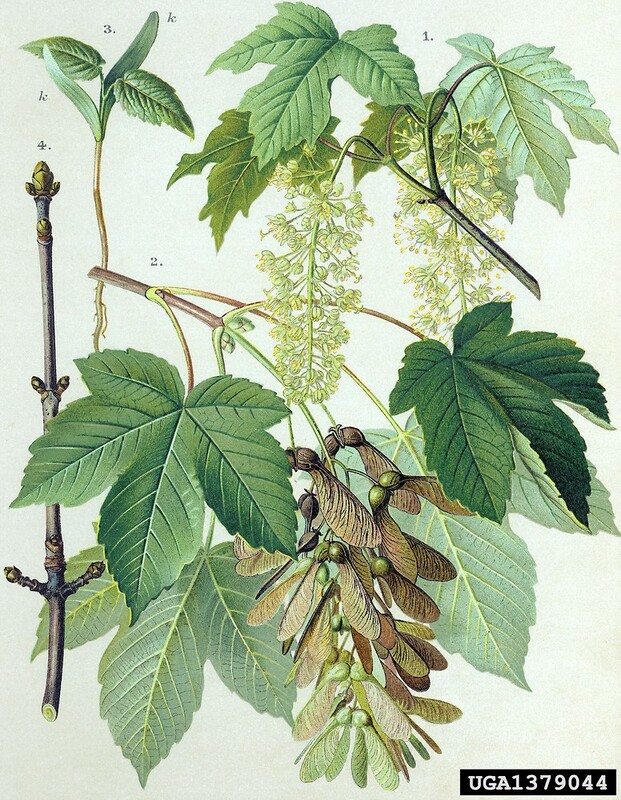 Acer pseudoplatanus. By Zelimir Borzan. Copyright © 2016 CC BY-NC 3.0. Bugwood – www.bugwood.org (accessed 7/2014). Leaves opposite, stalk sap milky, stalk often reddish, blade 8-15 cm long and wide, 5-lobed, tips usually rather blunt, dark green above, underside whitish, veins closely spaced, prominent with a characteristic “fish-bone” pattern; autumn color yellow (USDA, NRCS 2007). Flowers yellow-green, in drooping, elongate irregular, unbranched clusters, shaped like small grape clusters; blooms May; insect pollinated (Paterson et al. 1996). 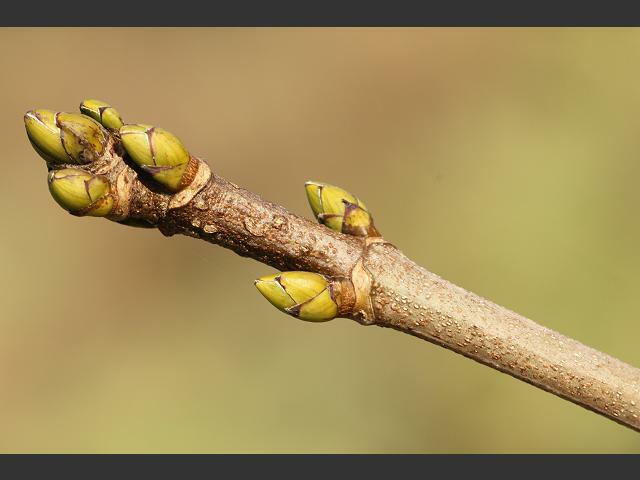 Acer pseudoplatanus buds_18-01-11_1.David Fenwick.aphotoflora.com (Accessed 8/2016). Habitat: Escaped from cultivation. Seedlings and saplings shade tolerant; prefers soil pH 5.8-7 (USDA, NRCS 2007). Notes: Leafs out earlier than native forest plants and remains green longer into autumn. Displaces and may shade out native understory plants and saplings. Listed as invasive and banned in Connecticut and Massachusetts; listed as a noxious weed in 46 states, not including New York or New Jersey (USDA, NRCS 2007). Listed as an invasive alien by the Invasive Plant Atlas of New England (Mehrhoff et al. 2003). Not as frequent as A. platanoides but becoming more common and invading more forests. Was listed as one of the “top twenty” invasive alien plants by the NYS Natural Heritage Program’s Ad hoc committee on invasive plants. Seeds probably eaten by some birds and small mammals. Studies in the UK found that slugs are predators on seedlings of A. pseudoplatanus (Paterson et al. 1996). Reproductive adults can be killed by complete girdling or by heavy canopy pruning for a couple of years. This also sharply decreases seed production. Hand pull seedlings. Weed wrench saplings. A host tree of the Asian longhorn beetle, Anoplophora glabripennis (see Norway maple).